Sunflower Cottage in Strensall, near York, Yorkshire sleeps 4 people. 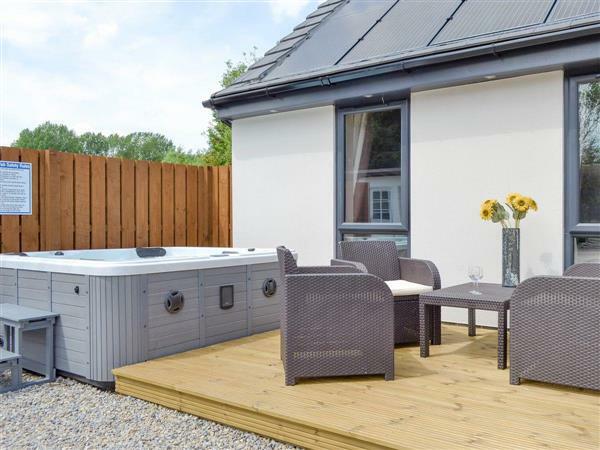 Sunflower Cottage near York is a stylish and contemporary single-storey detached property which has been built to a high specification and boasts a five seater hot tub on the decking. The owners live on site and are on hand should you need advice or assistance during your stay. Strensall is a charming village on the River Foss with a wide range of facilities including three pubs, a choice of grocery stores, post office, takeaway and a fish and chip shop. On the doorstep is York Golf Club, and Strensall Common, a huge conservation area maintained by Yorkshire Wildlife Trust, is popular with birdwatchers. Regular buses run from the village into the centre of the ancient walled city of York, 7 miles. Steeped in history and brimming with attractions, York appeals to all ages throughout the whole year. Visit the magnificent minster, the Jorvik Centre and the Railway Museum, browse the art galleries and stroll along the cobbled streets and city walls. There are numerous restaurants, tea shops and an abundance of inns serving real ale. Enjoy a day at the races, take a river boat trip or watch the talented street entertainers. The surrounding area has much to offer too, with stately homes at Castle Howard and Beningbrough Hall, quaint market towns at Easingwold and Helmsley, and a short drive leads to the beautiful North York Moors where the famous steam train departs from Pickering and transports visitors through stunning scenery to the fishing port of Whitby. The coastal towns of Scarborough and Filey are also easily accessible, and after fun-filled days of sight-seeing, visitors can return to the comfort of this delightful holiday home and the relaxing bubbles of the hot tub! The shop, pub and restaurant are all ¼ mile from Sunflower Cottage near York. Sunflower Cottage near York is all on the ground floor. Living area: With 32 Freeview TV, DVD player, Bluetooth speakers and selection of books and DVDs. Kitchen area: With electric oven, electric hob, microwave, fridge/freezer, wine cooler and washing machine. Electric central heating, electricity, bed linen and towels included. Travel cot and highchair available on request. Decked sitting-out area with garden furniture and barbecue. Hot tub for 5 (private). Private parking for 3 cars. No smoking. Holidays at Sunflower Cottage run from Friday to Friday. For a better idea of where Sunflower Cottage is, you can see Sunflower Cottage on the map below. Sunflower Cottage is in North Yorkshire; should you be on the lookout for a special offer, you can find all the special offers in North Yorkshire. It's always worth checking to see what is on offer at the moment. Do you want to holiday near Sunflower Cottage (UKC2028), you can see other cottages within 25 miles of Sunflower Cottage; have a look to find your perfect holiday location.